The Mazda MX-5 has always been pretty clear about what it is. 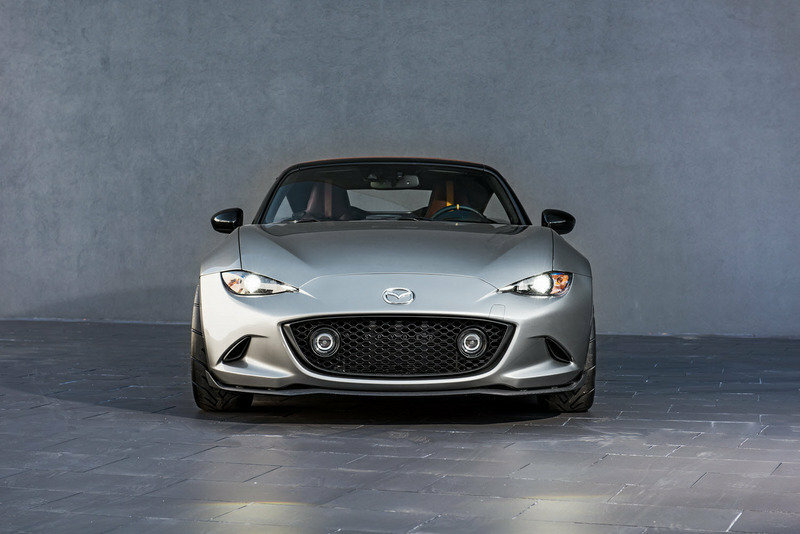 Mazda’s modern-day homage to the classic British roadster has been a single-minded vehicle since its inception, and not prone to being watered down by committee design. Just the same, Mazda has elected to take the MX-5 “back to its roots” with a pair of modified cars at this year’s SEMA show. The MX-5 Spyder is the more genteel of Mazda’s two show roadsters. With this car, Mazda has taken the classic-roadster link as far as it possibly can, adding vintage touches like bespoke leather and artistic detailing to remind viewers of the British, Italian and Japanese sports cars from sports-racing’s heyday. The MX-5 remains the closest modern car to the classic open-air motoring experience, with lightweight construction and minimalist styling. The MX-5 Spyder has been lightened compared to the production car, and features unique exterior details as well. Updated 11/04/2015: Mazda displayed the MX-5 Spyder concept, along with its companion the MX-5 Speedster, at its booth at the 2015 SEMA show. Continue reading to learn more about the Mazda MX-5 Spyder Concept. The MX-5 Spyder’s most distinctive feature are its unique Mercury Silver paint and unique roof. The new hue shimmers like the liquid metal from which it takes its name. The lines of the new MX-5 are nicely highlighted by the play of light over the new color. 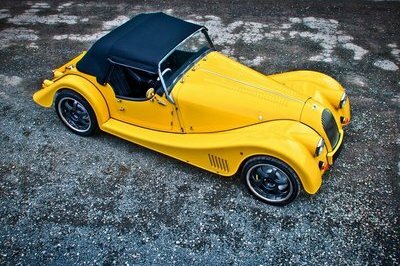 The custom top features flying buttresses that give the car a graceful look top-up or top-down as well as emphasizing the bare-bones aesthetic. Mazda has added RAYS Wheels to give the modified MX-5 a classic look. 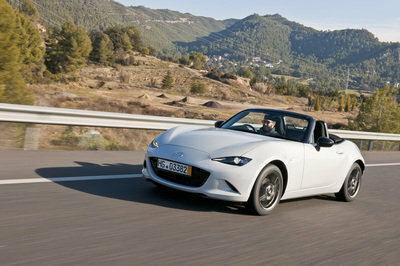 Note: Standard Mazda MX-5 pictured here. 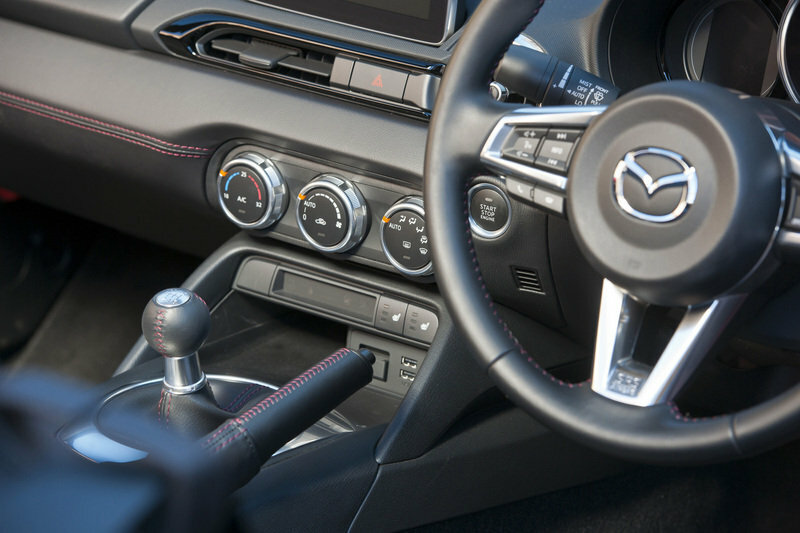 The mood of a classic roadster is set by the interior, so Mazda has paid close attention to the cabin. The interior’s leather is hand-crafted, and a number of aftermarket manufacturers contributed to the look of the MX-5 Spyder. When it comes to capturing the feel of a vintage roadster, the MX-5 has a good head start. The new MX-5’s two-seat interior is snug yet comfortable with a three-spoke wheel and a traditional ball shifter in manual transmission models. The interior’s wrapped in bespoke leather and has a simple design like the best classic cars; the leather interior is even combined with a touch of body-colored trim around the door tops. Delta Seat provides custom seating in the MX-5 Spyder. 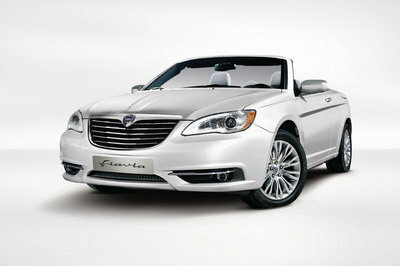 Just like the Speedster concept, the Spyder retains the production car’s 2.0-liter, SkyActiv-G engine. No details were released on the final output, but the standard 155-horsepower still sounds pretty good. The Spyder concept however, should be more energetic thanks to lightening efforts. The 2,332 pound MX-5 is already an automotive lightweight, and less weight equals more responsiveness. The suspension has been upgraded by KW Suspensions and H&R Springs. The MX-5 is already a capable handler, so the enhancements might seem unnecessary. The MX-5 Spyder is a subtle concept, with an emphasis on attitude rather than ultimate performance, and that makes it just the sort of concept MX-5 that Mazda has a habit of putting into production. 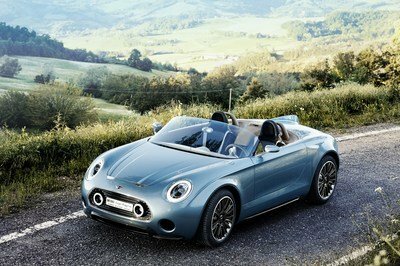 If this aspirational and inspirational roadster creates enough buzz at SEMA, odds are in favor of a production version seeing limited production sometime in the future, which would be an appealing outcome indeed. Will there be a production version? The Mazda MX-5 Miata has been an exercise in honing the concept of a lightweight sports car for more than 26 years, created solely for driving exhilaration. But for the 2015 SEMA Show at the Las Vegas Convention Center, Mazda designers wanted to see what they could do if that idea was taken to the extreme. 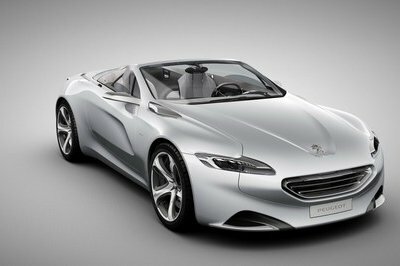 What they created were two vastly different takes on the fourth-generation MX-5: The 2016 MX-5 Spyder Concept and 2016 MX-5 Speedster Concept. MX-5 Spyder captures the character of a vintage roadster and translates it into a modern-day design, including bespoke leather interior details that were painstakingly crafted, and featuring a new Mercury Silver concept paint color. 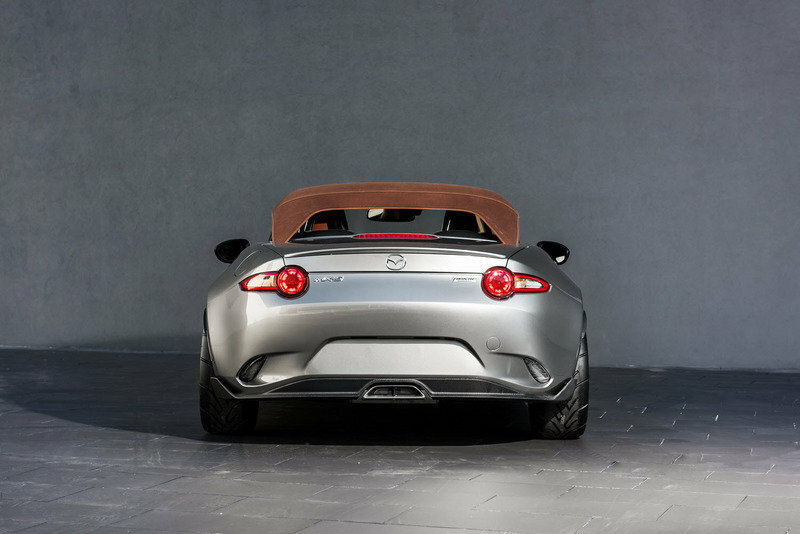 MX-5 Speedster is a study in the extremes of lightweight, purpose-built performance, paying homage to minimalist roadsters of the 1950s. The Blue Ether-painted MX-5 Speedster is uncompromised in its approach to wind-in-the-hair driving, going so far as to eschew a traditional windshield for a lighter deflector. Both cars are significantly lighter than the 2,332-lbs. MX-5 roadster that customers can purchase at dealers and come with a host of conceptual and aftermarket pieces and fabrication from partners including Racing Beat, Haartz Corporation, ASC – American Sunroof Corporation, Makin Industries/RAYS Wheels, KW Suspensions, Delta Seat, H&R Springs, Lusch, AC&A Manufacturing, Franks Fab Shop, Long Road Racing and SIM Specialty Interior Manufacturing. 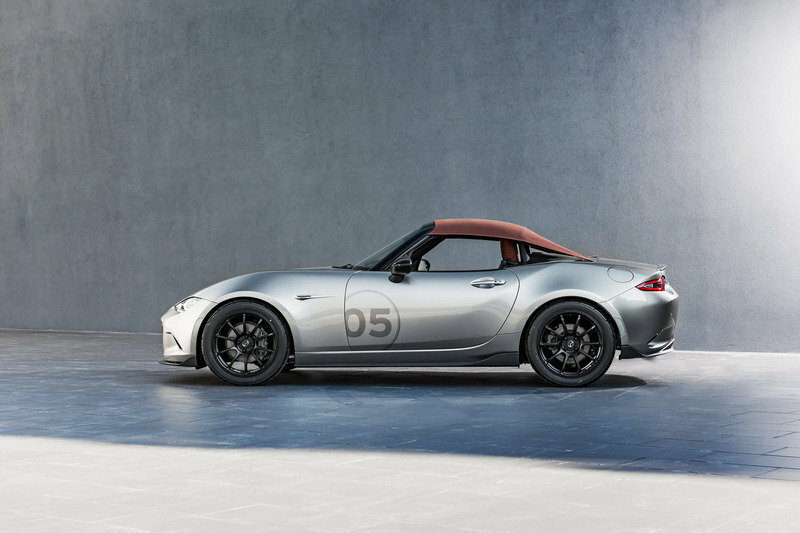 MX-5 Spyder and Speedster concepts will be on display at the SEMA Show on November 3-6 at the in the Mazda booth, #11647 in the North Hall.